A current Hermitage fellow, Michael Eade, a contemporary watercolour landscape painter from New York City, recently visited Sarasota for a residency and spoke on the Ringling College campus as part of his community program. Artists of all disciplines come to the Hermitage Artist Retreat to do their work inspired by the history and ecology of its special location. A current Hermitage fellow, Michael Eade, a contemporary watercolour landscape painter from New York City, recently visited Sarasota for a residency and spoke on the Ringling College campus as part of his community program. Eade received a BA from Oregon State University and did further studies at the Staatlichen Akademie der Bildenen Kunst, Stuttgart, and New York University’s Tisch School of the Arts. Eade’s works are in public and private collections around the country including the Harvard Business School and the Library of Congress. Below is Eade’s exclusive interview with Sarasota Visual Art. sVA: Did you know from the time you were a child that you wanted to be an artist? E: I remember from a very early age that I often got bored with the normal kid toys I had, so I would make things that I enjoyed more. Looking back, I think the actual making of the objects, whatever they were; i.e., a tin foil fountain or a to scale air balloon with a basket to hold people- was my actual play. I loved the problem solving and process of constructing the objects. I was fortunate enough to live in a house big enough to have a spare room where I was allowed to set up a project table, which I never had to cleanup. That table, I suppose, was my first studio. 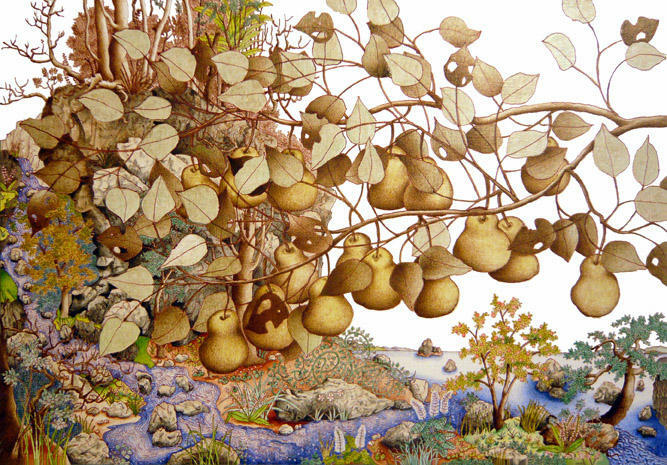 sVA: You have described your work as “lush, fanciful landscapes abundant with flora and sometimes inhabited by spiritual beings and beasts”. How has the natural environment of Sarasota and the Hermitage inspired your work? 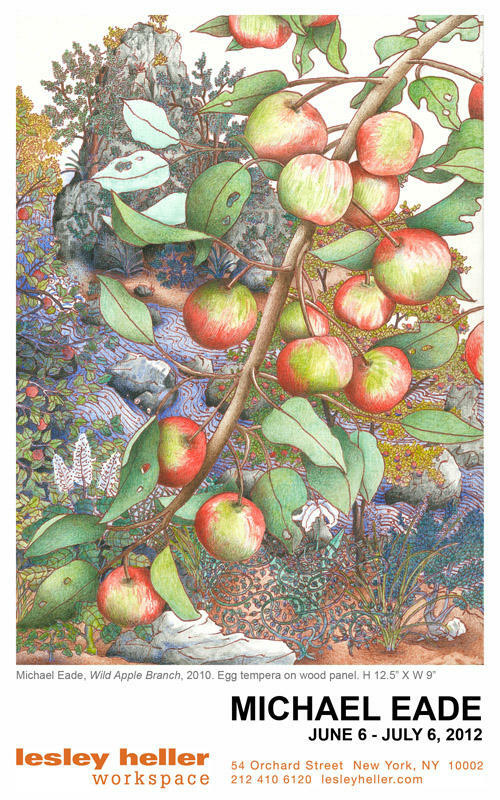 E: I always incorporate landscape and plant forms into my works, which I have personally experienced. What comes first to mind, is that I have never been on a Florida Key on the Gulf of Mexico before, and the native plant forms at the Hermitage were a big surprise- particularly the sea grape trees, wild poinsettia, “mother-in-laws tongue”, and the Florida mangroves. As a landscape painter always seeking inspiration the experience of these discoveries is turning out to be an invaluable addition to an on-going progress in my work. A second important effect of being at the Hermitage is the arrangement of the residency itself. As far as I know it is unique. Each artist is given six weeks to work at the Hermitage spread out over a two-year period. The artist chooses which weeks to be utilized there. This arrangement has given me time to gestate ideas and return to the Hermitage to execute specific works. About this time last year I spent my first two weeks of six and created watercolors of these new plant discoveries I just mentioned. I am back now for another two weeks, one year later, with a full plan inspired from my first visit for a new series of landscape egg tempera paintings, my normal medium. sVA: What parts of Eastern and Western religious and non-religious cultures attract/influence you the most and how does that show up in your art? E: There are two categories regarding Eastern and Western religious and non-religious art I am always thinking of when I compose a work – they are the major differences in the use of the non-perspective or multiple perspective landscape in the Eastern tradition versus the one perspective landscape of the Western tradition. 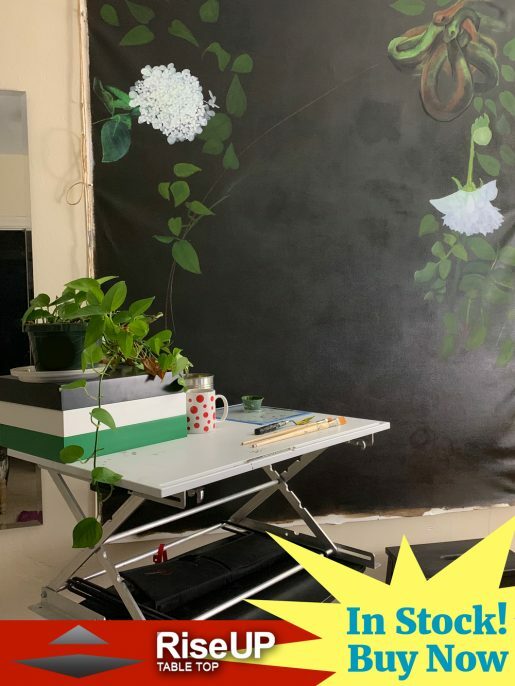 And respectively between the East and the West the technical methods used in the painting process of incorporating painting mediums and metal gilding, which I intentionally fuse together to fuel my hybrid landscape works. sVA: Do you see yourself as more of a producer of, or responder to, theory? And how do you balance the two? E: I always try to make sure to premise that I am not an expert on either the Eastern or Western histories of the landscape format. I’m just an artist who mines what appeals to his own personal needs or devices to construct new works. But this is an interesting question. I consider myself a producer. But I also consider myself a responder. I keep in mind our quickly global changing culture, and I am particularly interested in our burgeoning understanding of the universe at the macro and micro levels; i.e., the sub-sub-atomic and the grand expansion theories. I really think a lot about these two topics and discoveries when I am composing each landscape. sVA: What role does history play in your work? E: There are two histories playing major roles in my work. There is the personal history and the art/global history playing out. I see them as balancing each other within my process, because I do very much consider and incorporate them both when I am composing a new work. Personal history and art history combined can become a powerful mirror reflecting new meaning in a contemporary work of art. 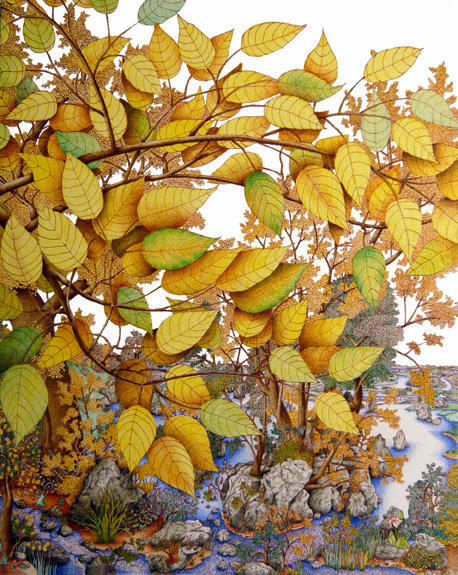 sVA: Could you discuss the evolution of your landscapes in egg tempera and your ongoing explorations into the realm of contemporary landscape painting? E: I had to travel to Germany and was accepted to enroll at the Art Academy of Stuttgart to learn the ancient and archival medium of egg tempera. I’ve chosen to use egg tempera because of its unique visual qualities. The translucency and vibrancy of color I am able to achieve with the medium enhance the goals of my work better than other mediums I have tried such as oils. I’ve worked and evolved to create paintings that evoke emotion and meaning for myself and the viewer. The easiest way to describe my evolution is to say that I am on a journey to provide painted landscapes no one has experienced before utilizing an ancient medium. sVA: How did you arrive at the structure of your work? E: At the beginning of composing each painting I have set a visual idea and message for the work. I usually create a very fast and small sketch. Before that I have put together a binder of image references and text references I feel I will want to reference. Then I set out and directly begin composing the landscape on the prepared wood panel or canvas. sVA: Do you consider yourself a realist? E: I usually describe myself as a figurative landscape painter. sVA: How much time do you spend working on core skills like drawing? Is that still important even to someone who has reached a certain ability in their art? E: Each of my paintings begins with line drawing, which I then paint over with egg tempera. So I am drawing every day. My skill increases with my familiarity of each new subject I render, so I would say yes to the second question. sVA: Which of your works reflect you most as an artist? E: The whole body of my work describes my evolution. “Mount Tabor” from 2009 probably best reflects the current aesthetic point in my career. sVA: How was the response from your recent lecture on the Ringling College campus? E: I have been told it was very positive and enthusiastic response. There were lots of good questions from the audience, which helped guide me to talk about my work in way which I hope benefited them all. sVA: What is your daily schedule like? Is it important to keep a routine or does your day change depending on what you need to accomplish? E: I work every day, and I maintain a regular routine, which I prefer not to deviate from so my workflow is constant.